09/01/17 Southeast toyota distributors, llc (set) is recalling certain 2011-2016 toyota tacoma and 4runner vehicles equipped with accessory hood scoops installed by set or set dealers. the adhesive attaching the hood scoop may weaken, allowing the hood scoop to detach from the vehicle. 12/15/16 Toyota motor engineering & manufacturing (toyota) is recalling one 2016 toyota 4runner vehicle manufactured november 1, 2016 and one 2017 lexus gx460 vehicle manufactured november 16, 2016. the affected vehicles are equipped with takata pspi-ld front passenger air bag inflators that may have been manufactured without ignition booster tablets. as a result, in the event of a crash, the air bag may not fully inflate during deployment of the primary stage. as such, these vehicles fail to comply with the requirements of the federal motor vehicle safety standard (fmvss) number 208, "occupant crash protection." The improper inflation of the passenger air bag may increase the risk of injury in the event of a crash. 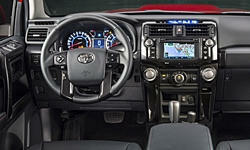 Toyota dealers have replaced the passenger side air bag modules, free of charge. toyota notified the affected dealers on december 15, 2016. owners may contact toyota customer service at 1-800-331-4331. toyota's number for this recall is g06, glr. 09/15/16 Southeast toyota distributors, llc (set) is recalling certain model year 2010-2015 toyota 4runner vehicles manufactured september 3, 2009, to december 1, 2014. the affected vehicles may be equipped with accessory exhaust tips installed by set or set dealers that may contact people and possibly burn them while they are standing behind the vehicle. 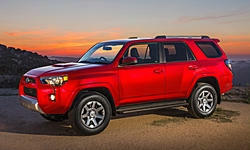 09/22/15 Southeast toyota distributors, llc (set) is recalling certain model year 2010-2015 toyota 4runner vehicles manufactured march 29, 2010, to july 30, 2015. the affected vehicles may be equipped with accessory exhaust tips installed by set or set dealers that may contact people and possibly burn them while they are standing behind the vehicle. 07/05/05 On certain sport utility vehicles, due to a manufacturing issue in the front suspension lower ball joint, there is a possibility that the surface of the ball of the joint may have been scratched. the ball joint may eventually experience excessive wear and looseness, resulting in increased steering effort. Dealers will replace the front suspension lower ball joints free of charge. the recall began on july 5, 2005. owners may contact toyota at 1-800-331-4331. Toyota recall no. 50j.customers may also contact the national highway traffic safety administration's vehicle safety hotline at 1-888-327-4236 (tty 1-800-424-9153), or go to http://www.safercar.gov. 12/01/16 Electrical and Air Conditioning Toyota motor engineering & manufacturing (toyota) is recalling certain model year 2003-2006 toyota land cruiser and lexus lx470, 2005-2006 toyota tundra and sequoia, 2004-2006 toyota 4runner and lexus gx470 vehicles equipped with side curtain-shield-air bags. the affected vehicles have an air bag control module that may be improperly programmed, causing the side curtain-shield-air bags to deploy inadvertently. Toyota will notify owners, and dealers will replace the air bag control module with one that has improved programming, free of charge. the recall began on december 1, 2016. owners may contact toyota customer service at 1-888-271-9371. toyota's number for this recall is g0c and glb. 01/17/18 Other Southeast toyota distributors, llc (set) is recalling certain 2015-2018 toyota 4runner vehicles equipped with an accessory billet grille overlay installed by set or provided by set and installed by set dealers. the u-nut that secures the overlay grille may fracture, allowing the billet grille overlay to detach from the vehicle. 09/01/17 Other Southeast toyota distributors, llc (set) is recalling certain 2011-2016 toyota tacoma and 4runner vehicles equipped with accessory hood scoops installed by set or set dealers. the adhesive attaching the hood scoop may weaken, allowing the hood scoop to detach from the vehicle. 06/15/17 Other Gulf states toyota, inc (gulf states) is recalling certain 2016-2017 4runner vehicles equipped with the tforce accessory package. the fasteners for the aftermarket roof rack may have been improperly tightened. 06/01/16 Other Gulf states toyota, inc. (gulf states) is recalling certain model year 2015-2016 toyota 4runner vehicles manufactured september 22, 2014, to march 23, 2016 and equipped with accessories installed by gulf states. the load carrying capacity modification label may not reflect the correct added weight of the installed accessories. as a result, these vehicles fail to comply with the requirements of federal motor vehicle safety standard number 110, "tire selection and rims for passenger cars."